The Quick Fire started off with an unlikely guest in the kitchen. Padma introduced this weeks guest judge, New England Patriots player Rob Gronkowski. He was here to eat whatever the contestants served him, hoping it would fill his big appetite. The Quick Fire this week; cook a BIG sausage. That’s it. Sausage can be a tricky one to master. The hardest part is making sure the casing is properly on, which many of the chefs struggled with. 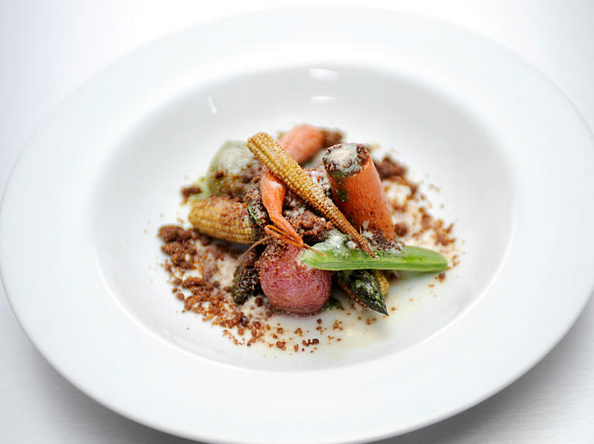 The chefs stuck to their traditional roots. Doug went with a beer braised pork sausage, Melissa choose to cook wild boar and pork, and Mei went Asian, filling her sausage with pork, ginger, fish sauce and a yuzu aioli. Melissa and George seemed to struggle the most with the casings. Melissa pulled forth, but made super tiny sausages. George kicked the idea to the curb and went with a veal and pork sausage patty with a sunny-side up egg and potato hash. Rob was pretty satisfied with most of the dishes, but when it came time to pick the bottom and top, it seemed like an easy decision. Gronkowski was not so satisfied with Gregory and Melissa, leaving them on the bottom. Gregory’s sausage ended up being way to spicy for him and Melissa’s casing problem left her with tiny sausages unfit for the tight end. Just as it seemed Gregory was getting out of his funk, he was put right back in the bottom. George and Doug ended up on top, giving Rob the heartiest of the dishes. George, although he did not technically produce the traditional sausage, took the win and immunity for the next challenge. George is really making the best of this comeback. 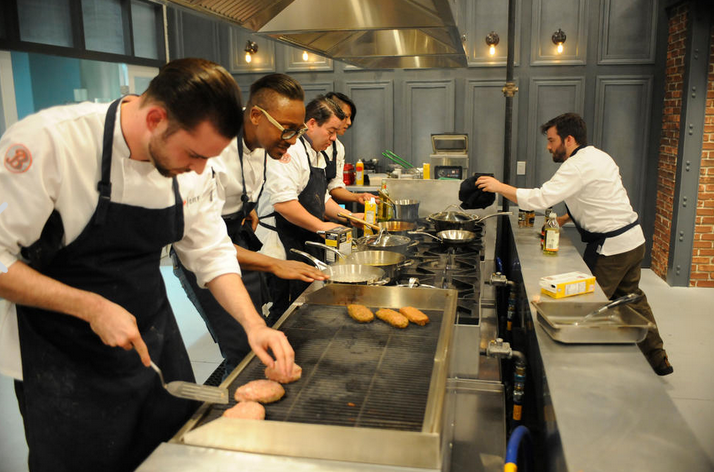 While I don’t think he is creative enough and a big enough risk taker to make it until the end, he sure is stirring up the competition for the remaining chefs. Now for the elimination challenge. This weeks challenge took on a new perspective of literature. Each chef had to pick a literacy author and incorporate his or her literary elements on to the plate for the specific author. Greg went first and picked Edgar Allen Poe, Katsuji was up next and went with Stephan King. George, who had immunity, picked Dr. Suess. Melissa and Mei choose Hawthorne and Thoreau, leaving Doug with the uplifting Emily Dickinson. The chefs took a look at the authors works and then jolted off to Whole Foods to see what they could find. Once the chefs start cooking, it seemed many of them did not pay close attention in high school English class. After picking apart the text, they each picked a specific work or trait of the author and went from there. Some of the chefs seemed to have a better hold on their dishes then others. Gregory seemed to get caught up in the challenge description and forgot about connecting the elements on his plate. George does not take any risks and cooked some fish, based on One Fish, Two Fish, Red Fish, Blue Fish. Mei and Melissa went vegetarian and based their foods around farming and history of their authors. Melissa was concentrating more on bridging together unlikely flavors, while Mei was hoping her technique of the charred onion soil and snow would wow the judges while bringing huge flavors to her dish. Doug focused on the sunset elements of Dickinson’s poem, making a carrot soup. Katsuji was not leaving anything behind. His dish was complex and visual, showing the beets to represent blood on the plate. Would the complexity play off? The judges tasted the food and had minimal complaints. Tom even said that this is best food they had all season. In the end, Mei’s visually stunning technique paid off and she ended up with the win! She was joined by Melissa with her take on spring vegetables and fall broth and Doug, who managed to wow the judges with his carrot soup. bottom. George had immunity so it came down to Greg and Katsuji. Gregory tried to back his dish of seared beef tenderloin, grilled hen, parsnip puree, beets, and crispy nori, but in the end got caught up in the challenge and forgot about the flavors of his dish. His meat was cooked unevenly, and the elements did not match up. Katsuji was truly making a statement with his dish. He did what the judges wanted and brought the book to the plate, but the ingredients failed him. 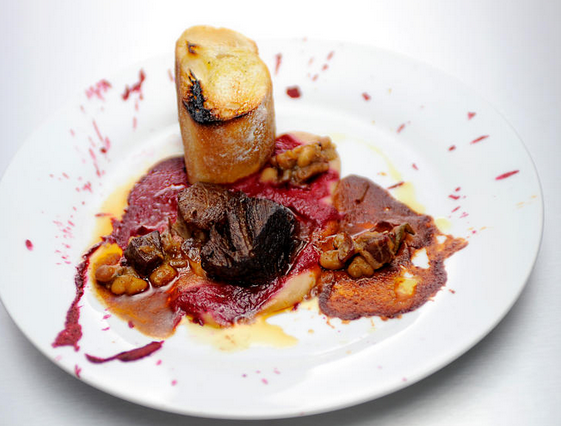 He served them a Serrano ham, chorizo, short ribs, and veal osso bucco with white beans, red beet puree, and hot sauce. Simple right!? The judges were not thrilled with the sauces and thought the dish did not stand up to the rest. In the end, Katsuji was sent packing his knives. His over complex dish and use of one to many ingredients finally sent him home. 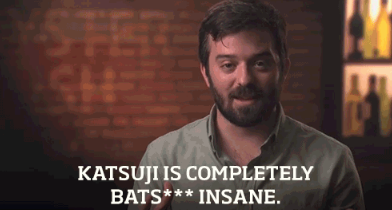 I was glad Katsuji lasted this long in the competition. In the first episode, I ranked him in the bottom three and for sure thought he was going to be sent home in the first few episodes. He proved himself in the next few episodes, even taking home some wins. He showed what he could do with a million ingredients and really stayed true to his style of cooking. 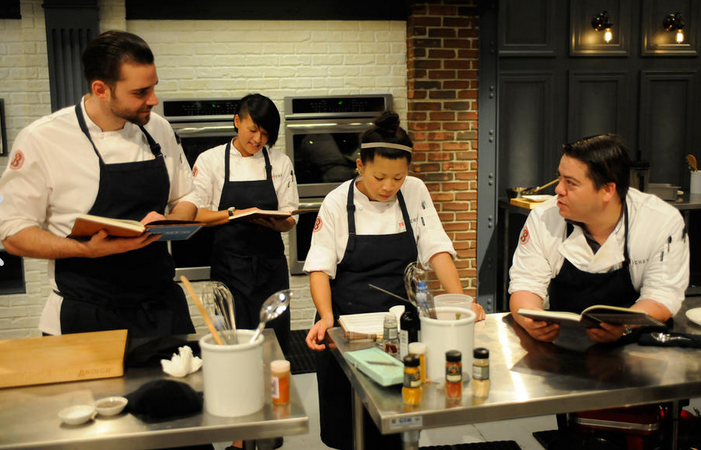 I hope he takes the win in Last Chance Kitchen, Katsuji would really stir up the competition!